Miley Cyrus moves fast. The fiercely inventive pop star has skipped from Disney darling to rebel-hedonist to tie-dyed hippie in less than a decade, celebrating each transformation with an album. Younger Now marks her next phase. A down-home, blue-skies blend of country and radiant pop, it’s a return to her Tennessee roots. 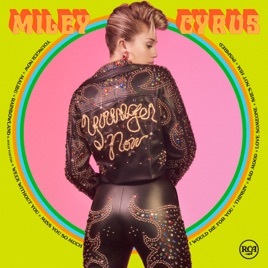 But Cyrus isn’t yearning for her childhood as much as summoning her inner child, seizing moments to flex a playful twang (“Week Without You”) or dream out loud (“Inspired”). Her godmother, Dolly Parton, joins her on “Rainbowland”, a politically charged sing-along full of sweet idealism: “Wouldn’t it be nice to live in a paradise?/Where we’re free to be exactly who we are?"